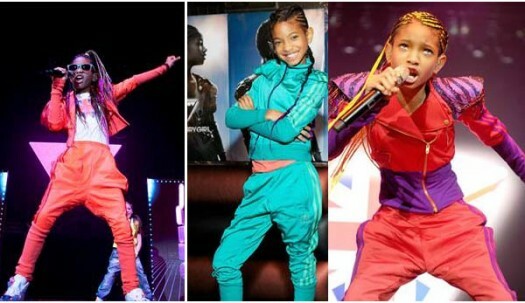 NEW YORK, Mar 27, 2011/ — While touring Europe with pop sensation Justin Bieber, break out star Willow Smith has been clad in head to toe adidas Originals. The young songstress has performed in custom made adidas Originals Fire Bird Tracksuits. The tracksuits embrace Willows’ youthful spirit with bright color palettes and her daring sense of style featuring embellished exaggerated shoulders and high waisted drop crotch track pants. The tracksuits stay true to the adidas Originals heritage adorned with the classic three stripes. Willow was recently seen wearing the adidas Originals Decade Lows that are currently available for purchase at adidas Originals stores nationwide.